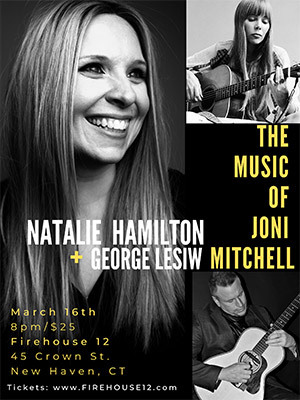 Natalie Hamilton makes her return to Firehouse 12 with her live performance project “The Joni Experiment", in which she explores and experiments with the compositions of the iconic singer/songwriter Joni Mitchell, with voice, guitar and piano. Hamilton is joined on stage by 20th Annual Long Beach, CA Jazz Festival Winner, guitarist George Lesiw. The guitar and Joni tuning connoisseurs out there will be delighted in Lesiw’s multiple guitars on stage, all in original Joni Mitchell tunings. The audience can enjoy hearing note by note transcriptions of Joni’s compositions, combined with newly-imagined guitar and piano arrangements. In addition, sprinkled throughout the evening, will be original songs off of Natalie Hamilton’s new self-titled EP, which will be available exclusively at the show. Please join Hamilton and Lesiw as they journey through the musical life of Joni Mitchell in what is sure to be a special evening. See more about Natalie Hamilton and George Lesiw. More event information here.